At last a manufacturer has been able to take to a rally car capable of matching, even bettering, the performance of the Lancia Delta HF Integrale. The Italian team has had things all its own way for some two years and, with no real opposition, has romped to the top of results lists with boring regularity. But in Finland's Thousand Lakes Rally at the end of August, all that changed. Peugeot was the first team to spot the anomalies and ridiculous freedom of FISA's former Group B regulations for World Championship rallies, and to design and construct a car specifically to win such events. Their 205 Turbo 16 was purpose-built for rallying, as similar to a road-going 205 as a pneumatic tyre into a cartwheel band, and it immediately started its impressive run of victories. When FISA was panicked into revoking its Group B rules, Peugeot pulled out of World Championship rallying, and from that moment Lancia took over the winning streak with its Group A version of the Delta. Like other cars of that group, its entitlement to be called standard was tenuous, to say the least, but it did fall within FISA' s interpretation of a production car. No other manufacturer was able to match Lancia's immediate switch from Group B to Group A, and Delta successes have become monotonous. So often have these cars occupied several places at the head of the field, enabling the team management to decide which of its drivers should win, that Lancia winner-picking has become something of a joke. In Finland at the end of August Toyota. made its second appearance with the fourwheel-drive Celica 2000 GT-Four, and the tables were suddenly turned. Not only was the new car able to keep up with the Lancia Delta, but it stayed ahead of it for much of the time. 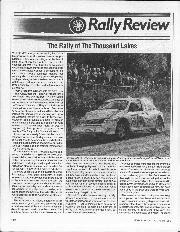 The Safari apart — for Lancia's win there was not certain until the final sections — the Thousand Lakes was, without doubt, the most interesting and exciting rally that anyone has witnessed for at least a couple of years. 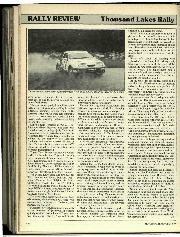 The close, fierce competition between Markku Alen in his Delta and Juha Kankkunen in his Celica was almost a contest on its own, keeping observers spellbound throughout most of the rally. Lancia must have found it strange not to be in complete control. Alen drove at his absolute limit all the time, and still he was unable to outpace Kankkunen, although the difference between them was never more than a handful of seconds. Kankkunen led by twenty seconds at the end of the first leg and by just three at the end of the second. 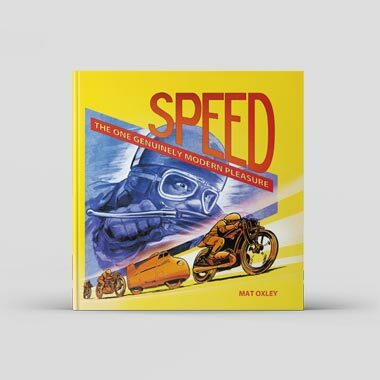 He was still ahead well into the third leg when, following an oil leak which caused a quickly extinguished fire, his engine failed only five of the thirty-nine stages from the end. His retirement immediately took the steam out of the rally. 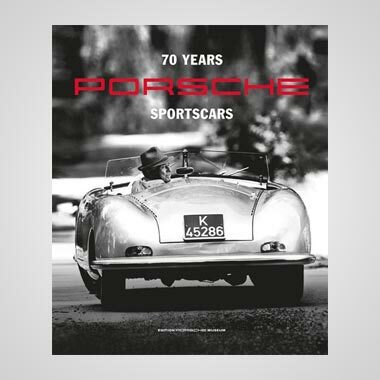 Had he continued to the end, the straight fight between two well-matched crews in two well-matched cars would have been taken to its conclusion, bringing, no matter which of the two had won, the satisfaction of a hard, close, start-to-finish contest. It was a great disappointment that this did not happen, but at least everyone now knows that Lancia no longer has a monopoly on World Championship wins. The rally itself was once again a model of smooth, unruffled efficiency, every facet of the organisation ticking like a clock. Results came through bang on time, sent directly by radiophone from portable terminals at the stages to the main computer in Rally headquarters. Even the arrangements for two royal visitors from overseas didn't cause a single ripple, which might not have been the case in some other countries we can think of. There were the usual huge crowds of spectators, but no traffic delays, thanks to revised tactics by the police. Jyvaskyla's police chief was, for the first time, in charge of traffic control along the whole of the route, and this arrangement worked well. The only hold-up seemed to be at a lake ferry which some service crews decided to use as a short-cut, to find themselves in a mile-long queue for the boat! The weather was good, although heavy rain in the weeks beforehand, signalling the end of a tropical summer, softened some of the narrower roads which were left somewhat rutted and worn after two weeks of note-making and memorising, the latter a speciality of Finnish drivers. 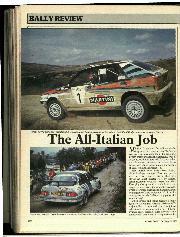 Lancia's team consisted of two cars, for Alen and Mikael Ericsson, but there were several others, including a Jolly Club car for Alessandro Fiorio, a privately-entered one for Argentina Rally winner Jorge Recalde, one entered by the importers for Sebastian Lindholm and another entered privately by Harri Toivonen. 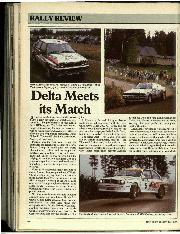 In fact, there was a total of 39 Deltas in the rally, 29 of them Integrales. Fourteen Deltas finished. Toyota Team Europe was strictly a two-car outfit, for the only other Toyotas in the rally were completely different models. Drivers were Kankkunen and Kenneth Eriksson. Three Sierra RS Cosworths were entered by Ford for Stig Blomqvist, Didier Auriol and Carlos Sainz, and there was a Group N version for Kyosti Hamalainen from Ford Finland. The Mazda Rally Team had two 323s for Timo Salonen and Hannu Mildcola, whilst other 323s came from Belgium for Pascal Gaban, from Sweden for Thorbjorn Edling and from Finland for Mikael Sundstrom. A single BMW M3 came from Prodrive for Ari Vatanen, and a single Opel Kadett GSi from GM Euro Sport for Mats Jonsson. The other works teams were those of Lada (six starters, six finishers); Wartburg (two starters, two finishers); and Trabant (three starters, one finisher). During the first leg, forming a loop mostly to the south-east of Jyvaskyla, it became quickly obvious that a Lancia/Toyota duel was developing between Alen and Kankkunen, for they took first and second-best times on all but two of the twelve stages, always only a few seconds apart. During this leg, both Kankkunen and Eriksson experienced difficulty changing gear, and this gave rise to a series of gearbox changes during the rally. The trouble was in the selector mechanism, it being sometimes difficult or impossible to select a gear (third and fourth in Kankkunen's case) and sometimes difficult to disengage it. 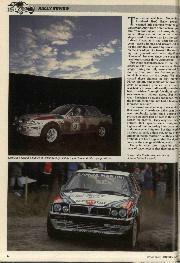 However, Kankkunen didn't show any sign of being perturbed, whilst his stage times did not reflect any problem at all. Had his gearbox functioned properly all the time, we wonder how much faster he would have been! Alen, on the other hand, needed a new fuel pump, whilst Salonen suffered fuel starvation, very peculiar handling caused by crabbing, loss of power-steering and a misfire which seemed to be corrected by reducing the turbocharger boost pressure and changing the spark plugs. At the end of the leg, a new turbocharger was fitted. Among the Fords, both Blomqvist and Sainz experimented with various types of spring to prevent the rear kicking up too high on brows. 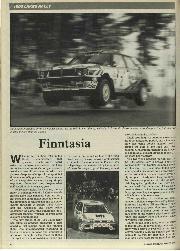 Blomqvist later hit a log and bent a front strut, slowing him on the stage but producing no road penalties after the replacement. Auriol experienced severe oversteer under braking on left-hand bends, and the problem persisted for so long that he got used to it. He even asked his mechanics to arrange the same characteristics on right-hand bends! 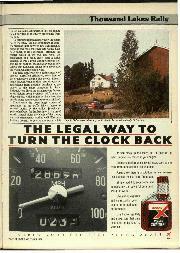 Early in the second leg, Vatanen came to a sudden stop against a tree, and news from the field was that he was seen by other drivers sitting on a log drinking milk — the beverage marketed by his sponsors. Mikkola also retired in the second leg when his engine temperature rose and the power fell to almost nothing. He suspected main bearings, and this was later confirmed, due to a broken oil-pipe from the pump. Kankkunen's gear selectors continued to give trouble, but he still drove at undiminished speed. He lost the lead for a while, but soon regained it, and the fight between these two had become such a national talking point that radio stations reported the situation after every stage, immediately their times became known. Each was determined to beat the other. Blomqvist's clutch and housing were replaced after the lining had disintegrated, damaging the interior of the housing, whilst Auriol had a new gearbox fitted after having it jam in fourth. The replacement had a synchromesh and was merely a temporary measure until a non-synchro box became available and could be installed. At the end of the second leg, Fiorio had a new alternator, Kankkunen new suspension and turbocharger (but not a new gearbox this time), Auriol suspension, gearbox and turbocharger, and Alen a microchip board in his engine-management computer. All seemed to be set for a stirring duel in the third leg, for Kankkunen was only three seconds ahead of Alen. However, the first indication of any problem with the Toyota came when leaking oil caught fire on the hot exhaust. This was quickly put out, but there was concern where the oil had come from. Three miles into the 34th stage, Kankkunen came to a stop with what he referred to as a "broken engine". That leak had been far more serious than at first thought. As far as the excitement was concerned, it was all over. Alen slowed down, allowing others to be faster than him on stages for he knew that his margin was enough to stay in the lead. 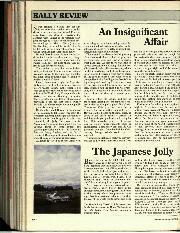 Salonen's Mazda began leaving a trail of steam and smoke, and required frequent replenishments of both oil and water. Indeed, a helicopter was organised to provide a shuttle service for water cans between a well and service points. Later it was found that the radiator filler-cap had lost its vital rubber seal, allowing the temperature to rise. There were fears for the head-gasket, but it was later found that a misfire was cured completely by replacing the turbocharger. Earlier, Salonen had been third, ahead of Auriol, and the Frenchman had given up trying to catch the Finn. 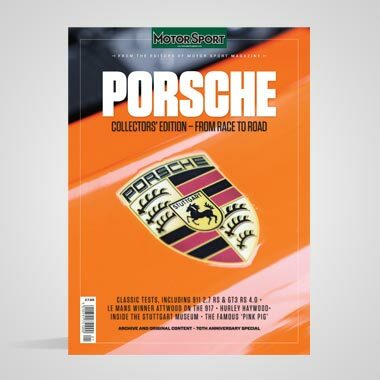 However, when Salonen was slowed by these problems, Auriol began to go flat out again and indeed managed to overtake Salonen to finish 35 seconds ahead of him, in third place.